PlusUrbia Design will lead a major community workshop to help plan a bright future for Little Havana that retains its many positive features while addressing its many needs. 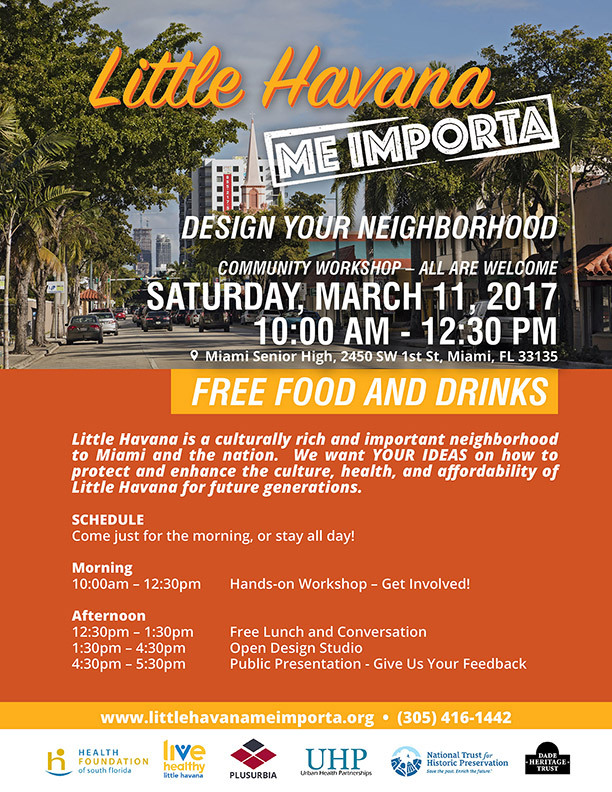 The workshop, conducted in English and Spanish, will take place at 10 a.m. Saturday March 11 at Miami Senior High, 2450 SW 1st Street. Lunch will be provided and there is free parking in front of the school. The meeting takes place in the library, which is on the second floor, on the east side of the building. Children are welcome and there will be a children’s table during the inclusive event. PlusUrbia, in collaboration with National Trust for Historic Preservation, Live Healthy Little Havana, Dade Heritage Trust and Urban Health Partnerships, is leading a master planning effort to improve and enhance Little Havana as a healthy community. The Saturday event includes a workshop 10 a.m.-12:30 p.m., a discussion during lunch 12:30 p.m-1:30 p.m, an open design studio 1:30 p.m.-4:30 p.m. and public presentation 4:30 p.m.-5:30 p.m.
Development pressures make this a crucial time for creating guidelines that will shape the evolution of Little Havana and how it is served by walkability, transit, park/open space, affordable/attainable housing, local jobs and healthy design. Little Havana is a culturally-rich neighborhood that is very important to both Miami and the nation. This event seeks an unprecedented amount of input from people who live and work in Little Havana — to protect and enhance the culture, health, affordability and authenticity of Little Havana for future generations.